Feel at home from the time you walk in. Very open floor plan with wood floors in living areas & kitchen, tile in bathrooms, carpet in bedrooms. Kitchen is a cook&apos;s dream - plenty of counter space and cabinets, prep sink in island, double ovens, large pantry, built in microwave & a great view of the golf course while you are cooking. Great room is big enough for a sectional couch. Master bdr has room for a sitting area, trey ceilings & great natural light. 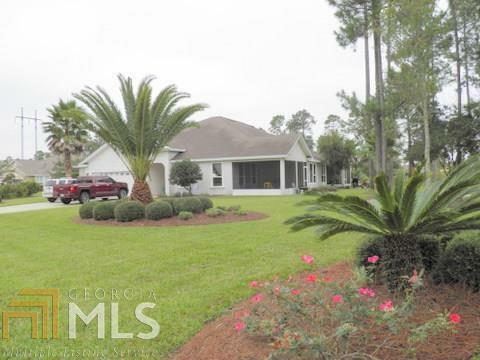 Master bath has jetted garden tub, tile walk-in shower, double vanity & huge walk-in closet. Laundry room includes a deep sink & closet. Screened tiled patio, 2 car garage w/paneled walls, attic storage, water softener.